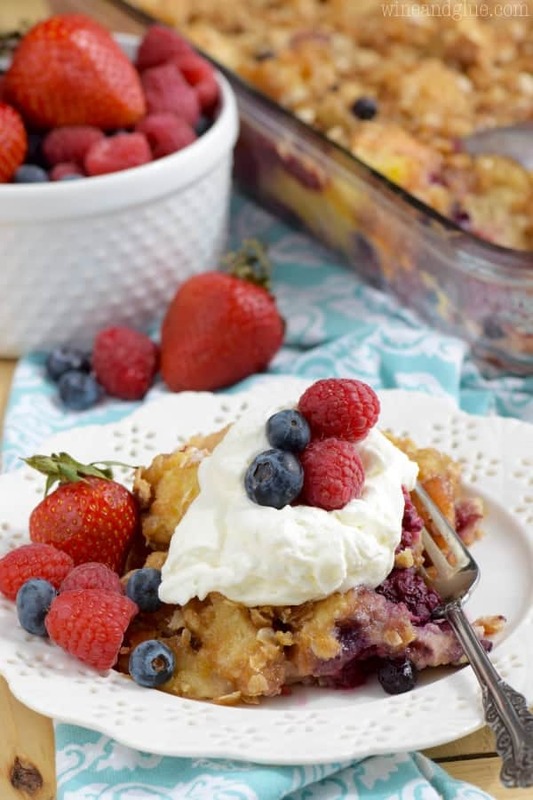 This Overnight Berry Cobbler French Toast is ridiculously easy to throw together the night before and then pop in the oven the next morning! 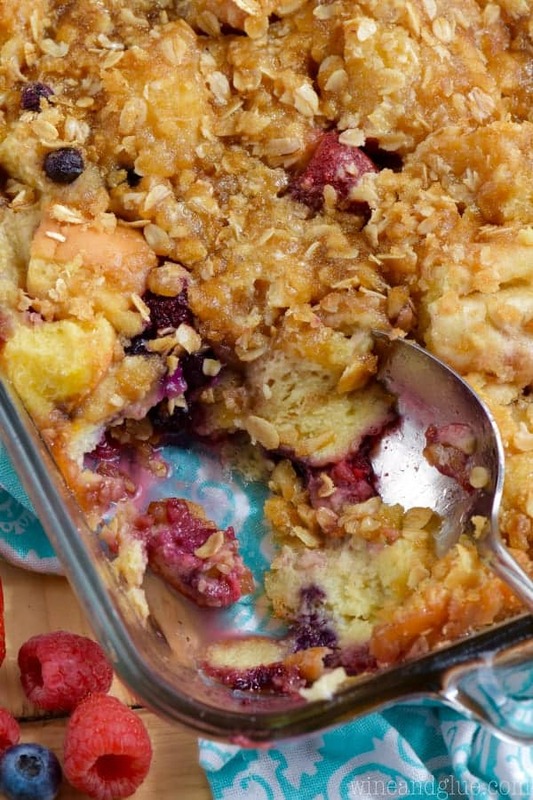 Perfect for holiday brunches and lazy weekends! 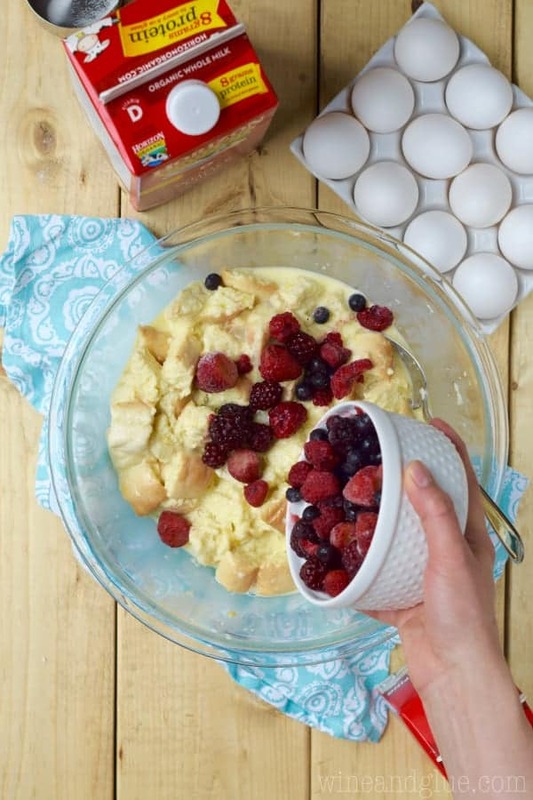 I’m so excited to be partnering with Horizon to bring you this easy breakfast recipe! As always my opinions are 100% my own. Recently I was reading an article about how crazy marriage can feel at this time in life. “This time” being when you have little kids and marriage and parenting is about tag teaming. It was totally right no! The dream Mother’s Day is supposed to be mom in bed until 11 and then pampered throughout the day but . . . you know, this time in life. So! Dads! Listen up! I get it! The idea of making mom breakfast in bed with the “help” of little hands on Mother’s Day sounds like an absolute nightmare. And now I have a solution for you! 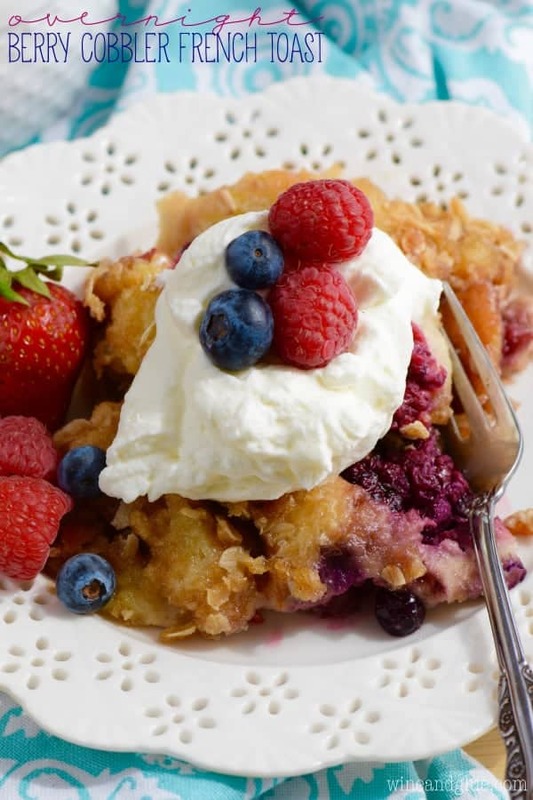 It’s called Overnight Berry Cobbler French Toast! You throw it together on Saturday night, after the kids are safely tucked away and no where near a dozen eggs that they will undoubtedly pick up by the top of the container while you watch in horror as they all fall to the ground. No, they will be in bed, and you will take 10 minutes to whip this up. You make the topping the night before and just set it aside, and then in the morning, you throw it in the oven with the kids and make some homemade whipped cream with them, because THAT will be easy to do with them. And then HOORAY! You can give mom breakfast in bed! An AMAZING breakfast in bed! Seriously, SO easy! 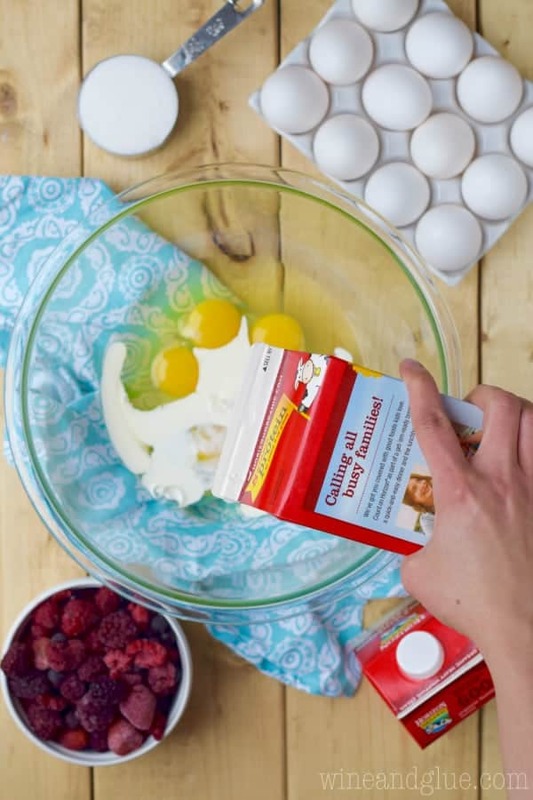 You start by cracking five eggs and adding a little Horizon heavy cream. Add some vanilla extract and sugar. Now add some cut up French bread and gently mix it so all the bread is coated. 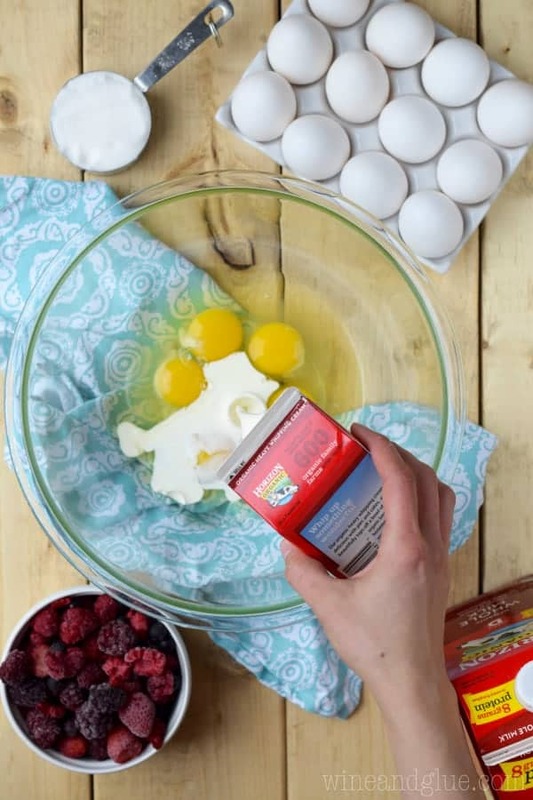 Throw in some frozen berries. And pour it all in a lightly greased 9 by 13 inch pan, cover and put in the fridge. 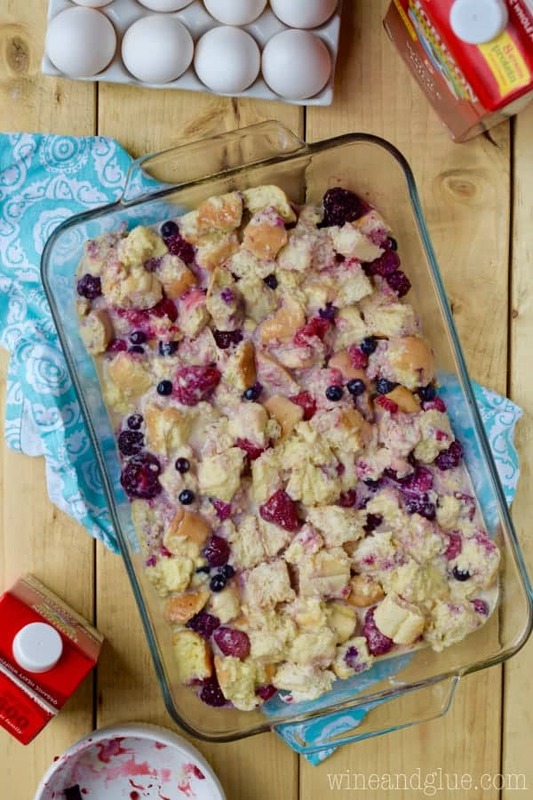 You can make the topping (which is SO GOOD) the night before and just store it in the fridge with your waiting French toast bake. Or you can make it in the morning with the kiddos so they can “help.” It just takes a few minutes. 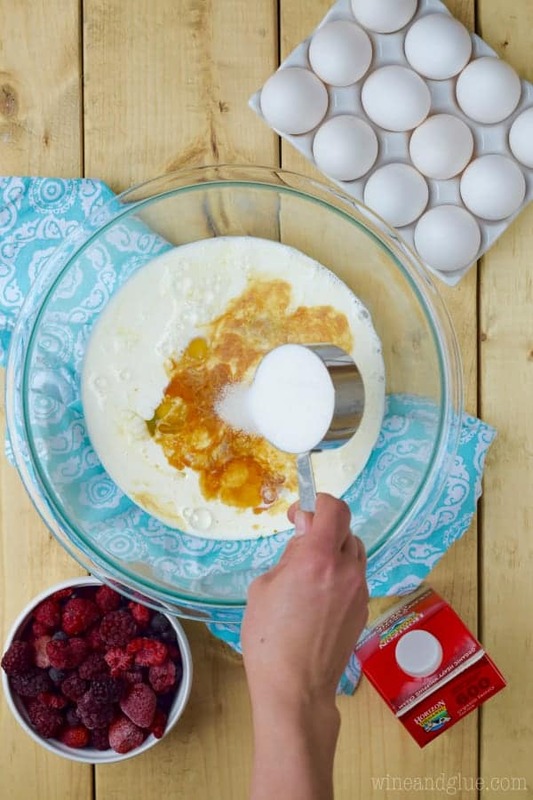 While it bakes up, make some homemade whipped cream! You will have plenty of Horizon heavy cream left to whip some up, and it literally could not be easier to make. Plus it is the perfect addition to the French toast. Doesn’t that all look like something you can do?! And I promise your kids will love it too! Be sure to follow Horizon on Pinterest, Facebook, Instagram, and Twitter for more great Mother’s Day (and everyday!) recipes! Prepare a 9 by 13 inch baking dish by spraying it with cooking spray. 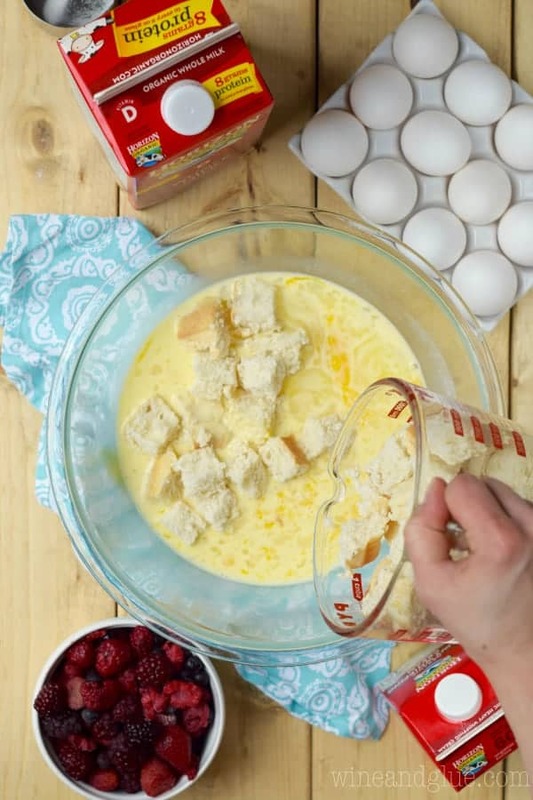 In a large bowl, combine the eggs, whole milk, heavy cream, whole milk, vanilla extract, and granulated sugar. Add the cubed French bread, and stir to coat all the bread. Then gently stir in the frozen berries. Pour the mixture into the pan, cover with foil and refrigerate for at least one hour or up to 24 hours. When you are ready to bake it, remove it from the refrigerator and preheat your oven to 350 degrees. Combine the brown sugar, butter, and quick oats together in a bowl using the back of a fork. Sprinkle over the french toast. Bake for 50 minutes or until the edges begin to pull away from the pan. There will be excess liquid there but you should still be able to see the bake pulling away at the end. Let stand for 10 minutes before serving (a perfect time to make your whipped cream). When you put the bake into the oven, put a large metal mixing bowl (or the bowl for your stand mixer) into the freezer as well as the whisk attachment(s) for your stand mixer or hand held mixer. Leave them in the freezer for at least 20 minutes or the entire time the french toast is in the oven. After removing the bake from the oven, take the bowl and whisk attachment from the freezer. Add the 2 TBSPs of sugar, and then add in 1 cup of heavy cream. Mix until peaks begin to form. 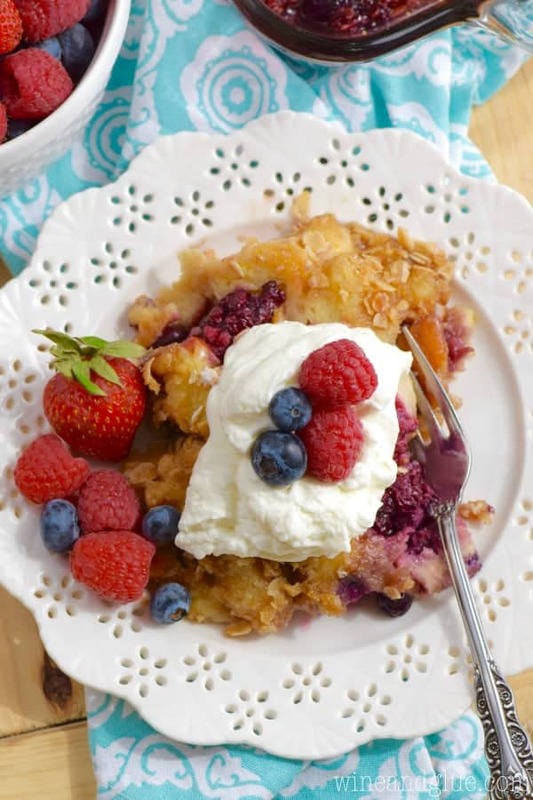 Serve over the french toast and enjoy! You should be able to gently push a finger into the butter but not go all the way through it. I slept in Sunday too, it was AMAZING! This looks incredibly delicious!! I love overnight breakfasts! Same here. It will be me making it too, but actually, if I make it, I know it will be good lol. This looks so great and I was looking for a make ahead recipe just like this!